It comes as no surprise that different parts of the world view the history of the world in different ways, or that the western view of history that I learned in school is not the only story. The history of the world is too vast and complex to wrap up neatly into a single coherent narrative, especially when different cultures view events through different contexts. This book presents an alternative view of world history: both events that are entirely ignored by the western worldview, and others that intersect and contradict that viewpoint. 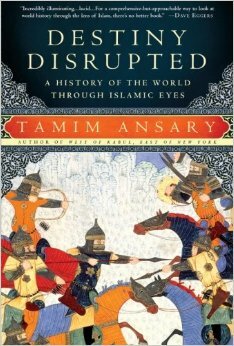 The series of events as laid out by Ansary is well-organized and well-presented, though he admits up front that it is a biased tale (just like the western version of history is). I listened to the audio version, read by the author, and enjoyed the narration. Normally, I don’t really read/listen to straight-academic sorts of nonfiction, but this one was really good, and I highly recommend it to those interested in other, non-western views of history. This entry was posted in 2015, Adult, Prose and tagged audio, divinity, historical, Middle East, mini-review, nonfiction, POC. Bookmark the permalink. I think this would have the potential to captivate me. History is written by the victors and every story has two sides. It would be great to get more of a perspective on events. Funny thing is, this is also written from the point of victors – just celebrating different victories and different kinds of victories. It was fascinating.